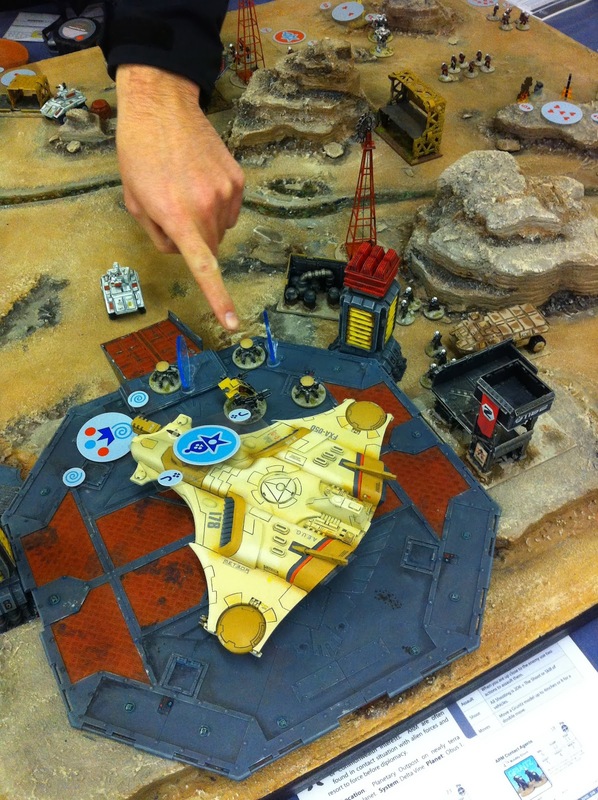 I used two 3ftx3ft boards at a recent club game with one as a planet-side board representing Kepler-62e and the the other is a moon board for Dactyl, Keplers orbiting moon. The East Hyadum Trade company expeditionary force (EHTC) is on an outpost base on Kepler-62e. Kepler-62e is a mineral resource rich planet although currently a desert planet after an enlargement phase of its nearest star heated the atmosphere. The EHTC also operate a transit and communication launch base on the orbiting moon "Dactyl". The EHTC are under duress due to a localised landing of a Neo-Sov force who arrived from a deep space transit sleep to be dropped onto Kepler. Their aim was to overwhelm the small defences around the EHTC launch pad and forward command base "Bose". The Neo-Sov forces have arrived from their home planet Mars (long since made habitable with atmosphere adjustment). 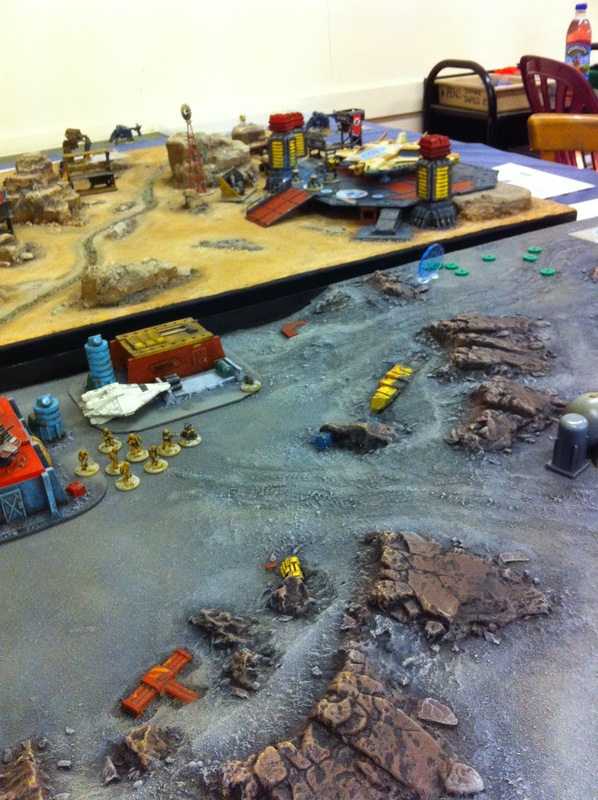 Miniatures used were a mix of GZG NAC troopers (painted red to represent the EHTC British expeditionary forces). The NeoSov forces are Khurasan. Kepler-62e has a big oil resource, being a desert planet that had in the past been a lush forested environment. The NeoSov government are unhappy with the EHTC getting an early planetary grab on this newly discovered resource and want to stamp their authority on a resource they could use to feed their massive factory zones on Mars. The 1st Magellanic Pioneers representing the EHTC expeditionary force are led by Major Zac Flower-Smithe and are in retreat with a goal of evacuation to the small Dactyl moon. 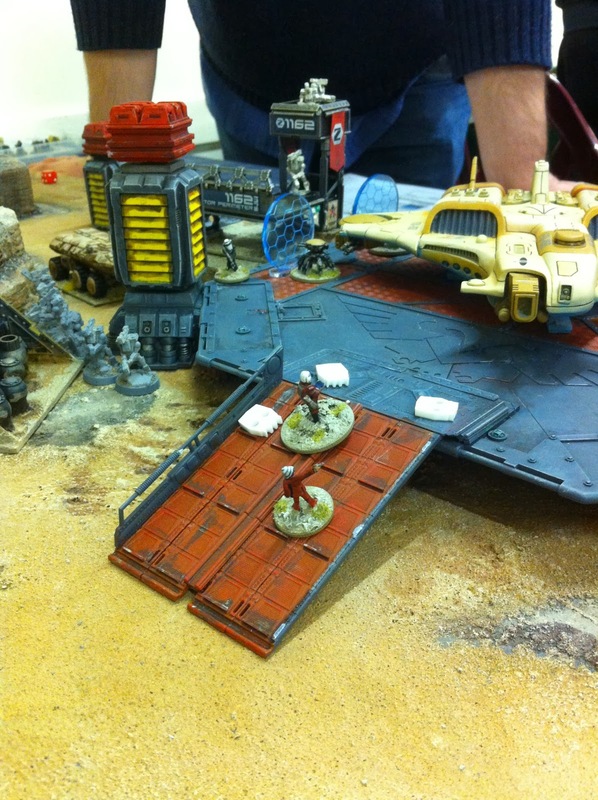 Their position is in defilade but the incoming Neo-Sov forces have forced a retreat order. An Ajax class dropship is on hand to take the retreating forces into orbit and for drop off on the dark side of the Dactyl moon. 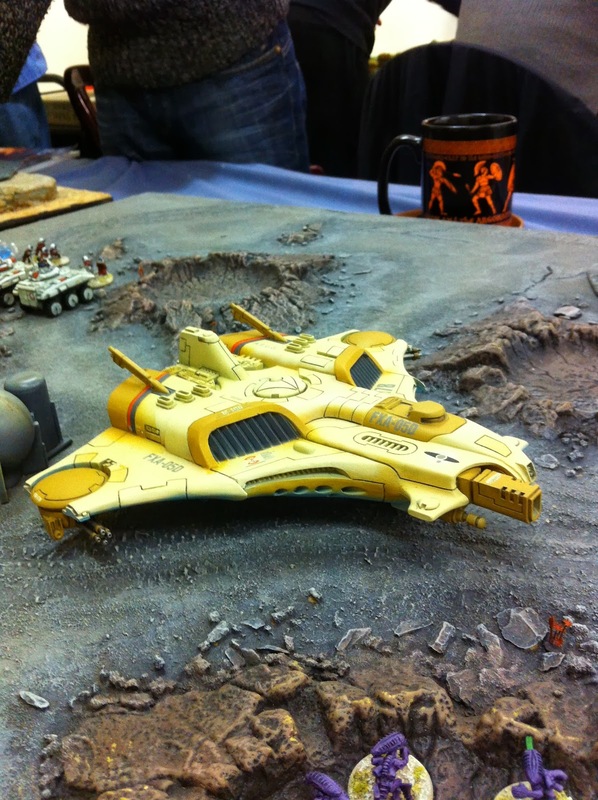 The Ajax dropship can carry 2 vehicles and 20 troops. 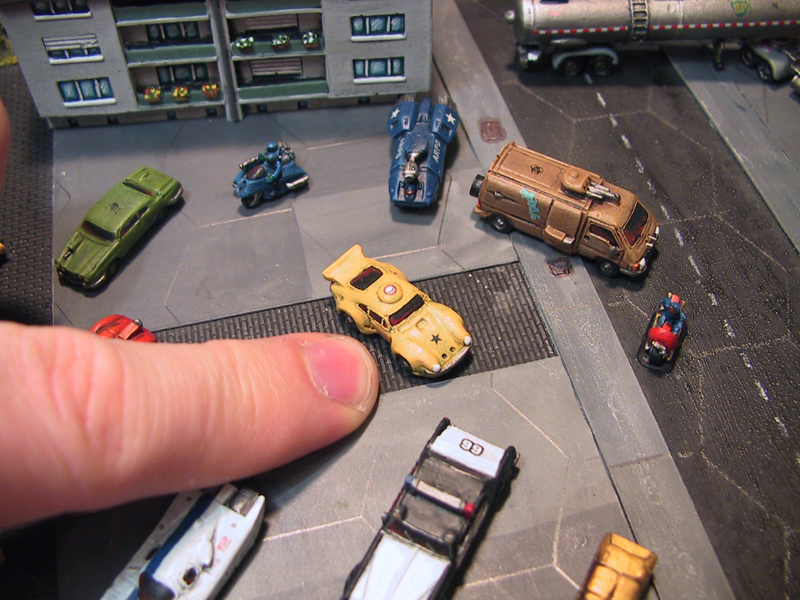 It will take 1 full activation to load a vehicle that is within 2" of the dropship. Planetary communications have been blocked for the EHTC so they must reach orbit and land on Dactyl (the grey moon terrain base) to get a message out for resources and to report the incursion. 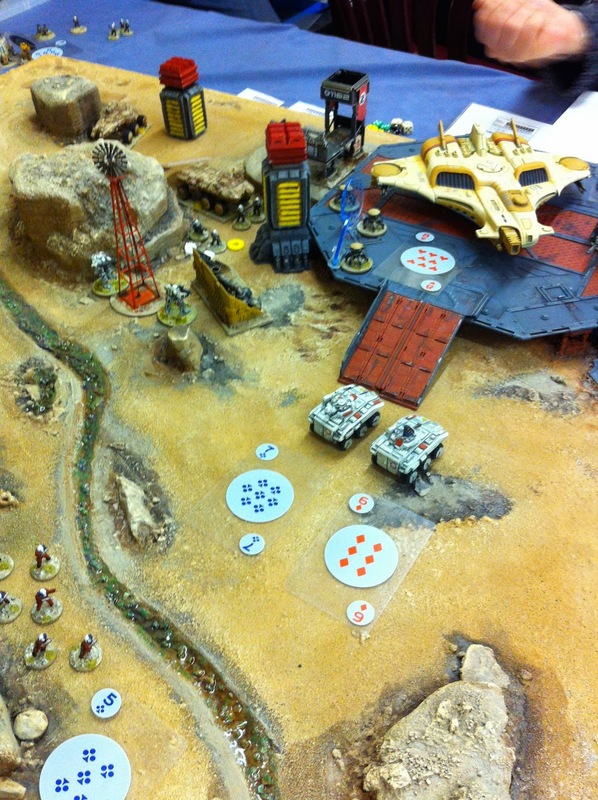 The Neosov objective is simply to focus on destruction of the local EHTC forces because they are not aware of the second base on Dactyl and are confident they can wipe out the defending forces with only minimal losses. Unknown to the EHTC their small orbiting base on the moon Dactyl is also just starting to face an assault by local alien fauna, awaking from its 3 Monthly breading cycle. Things are about to get nasty for the scientific team still based on Dactyl. The ground force may just get there in time to stop the alien assault, defend the Dactyl moonbase and get the message back to central services that the Neosov's are on the scene. 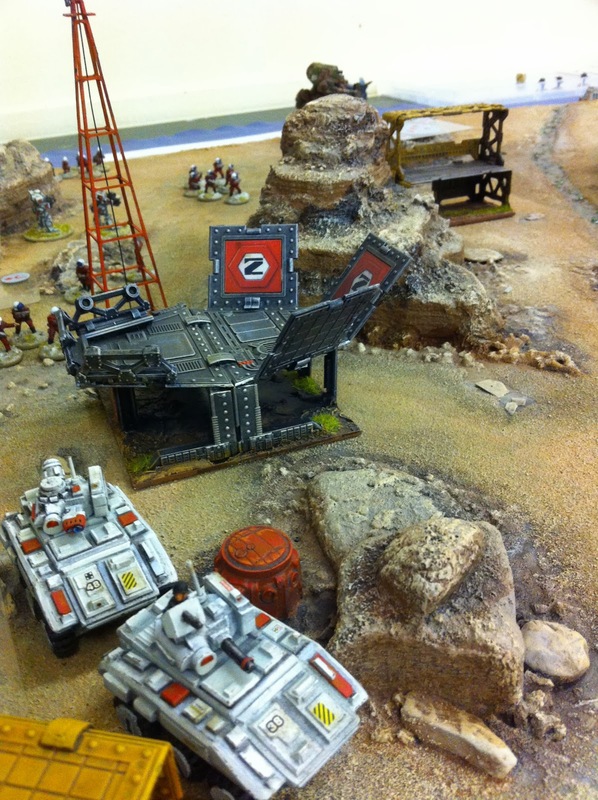 The Gruntz alternative card based activation was used in the game which added a lot of tension because the order in which the defending forces could activate and retreat from battle was determined on the luck of the card draw. You can see the cards dotted about in some of the photos. It was a very close game and we ran out of time to finish the second battle against the alien fauna on the moon. The Drop ship sustained heavy damage from satchel charges tossed into engine intakes but it manage to limp into orbit with a small force of EHTC forces before losing an engine completely. Some photos during the game follow with notes. 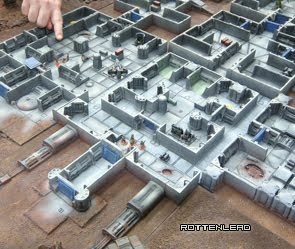 An overview of the layouts. 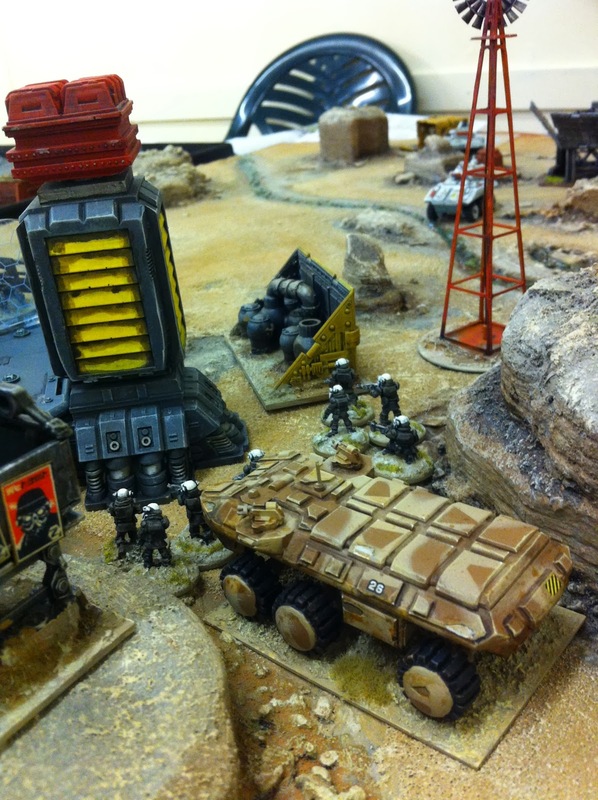 Late game the EHTC APC's (models from GZG) are nearing the launch pad for loading. One of the shields on the spider droids has been overloaded. 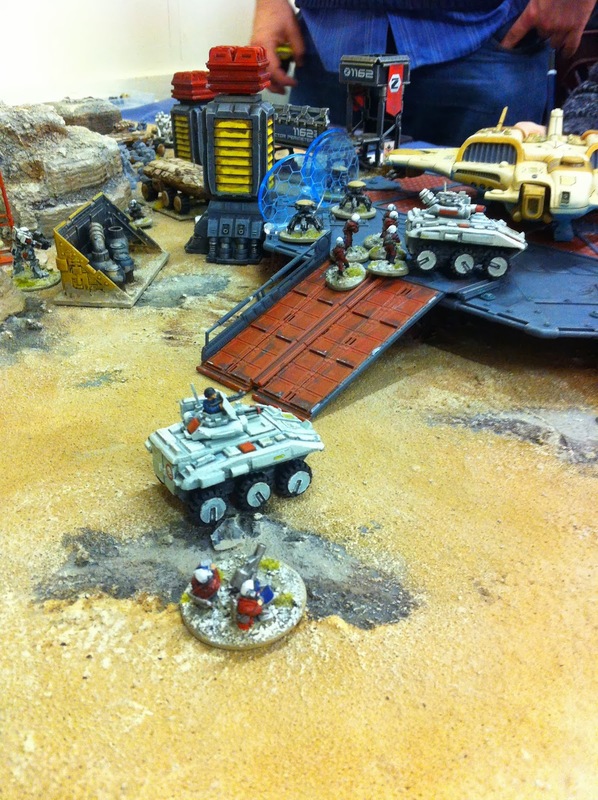 Deploying from the GZG APC a squad of Neo-Sov troops (models by Khurasan). You can see the activation cards laid on the table for the card based turn sequence which adds a random chaotic battle feel to the game (also ideal for solo play). The drop ship makes it off after sustaining a few satchel charges to the air intake, it still managed to limp into orbit and land near the moonbase. 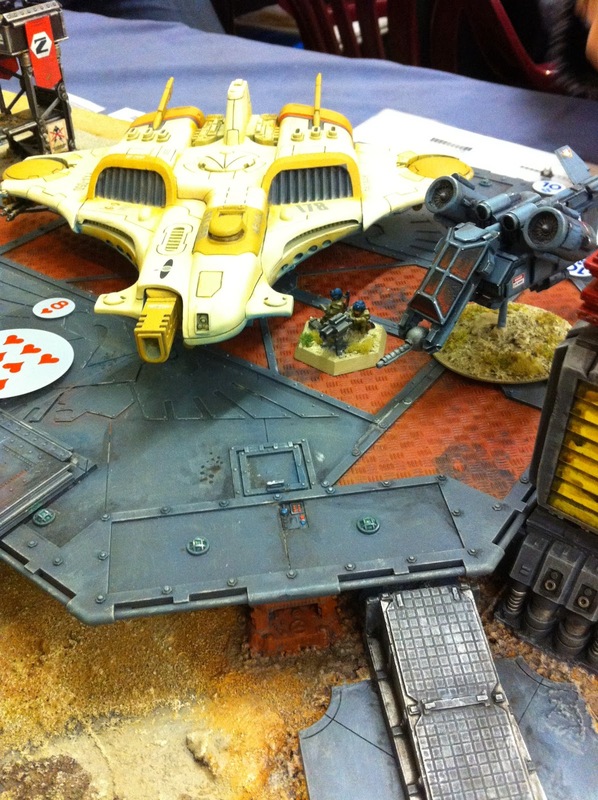 The Neo-SoV drop in a drop pod carrying a sniper specialist walker (Art crime minis Valkyrie). 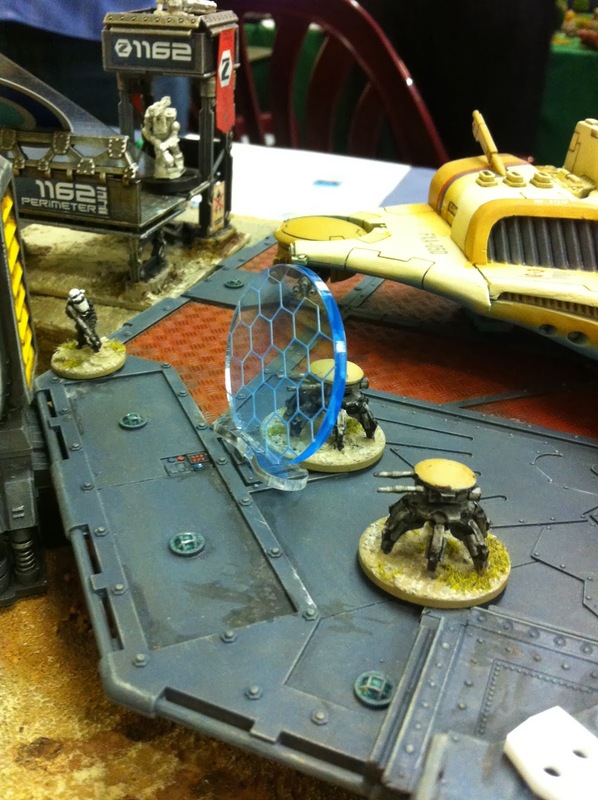 Drop pod from ClearHorizon miniatures. Landing directly on the launch pad the transport roach VTOL (GZG) deploys some Neo-Sov forces directly into the action. Near the end game some for the Neosov forces make it to the launch pad and start to throw satchel charges into the intakes of the drop ship. The commander of the EHTC forces under heavy sniper fire finally becomes a casualty only a few yards from the drop ship. 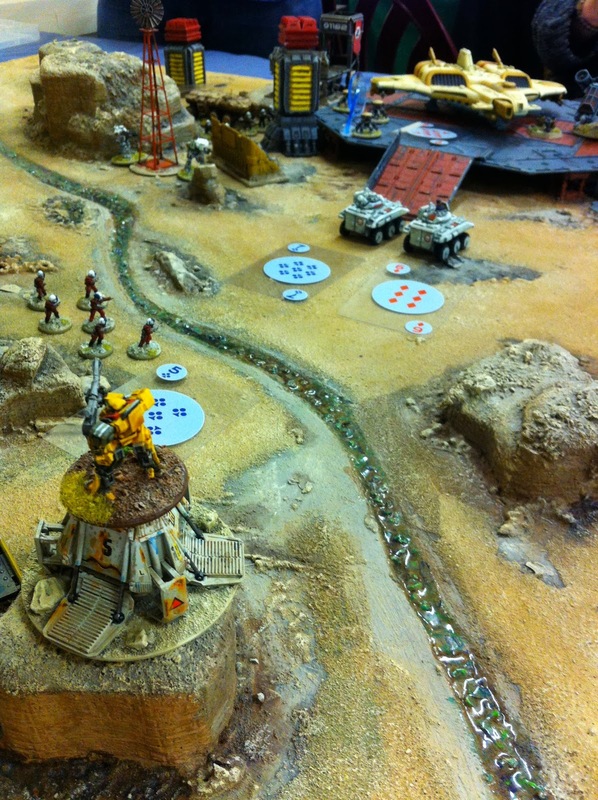 The red EHTC forces are approaching their escape zone. 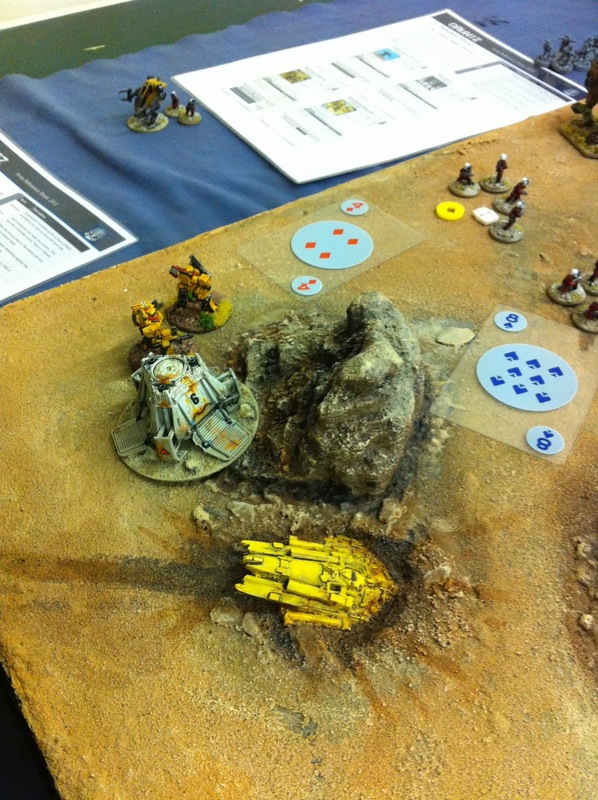 The Neosov forces are only held back by a line of shielded Spider Droids (GZG Models). 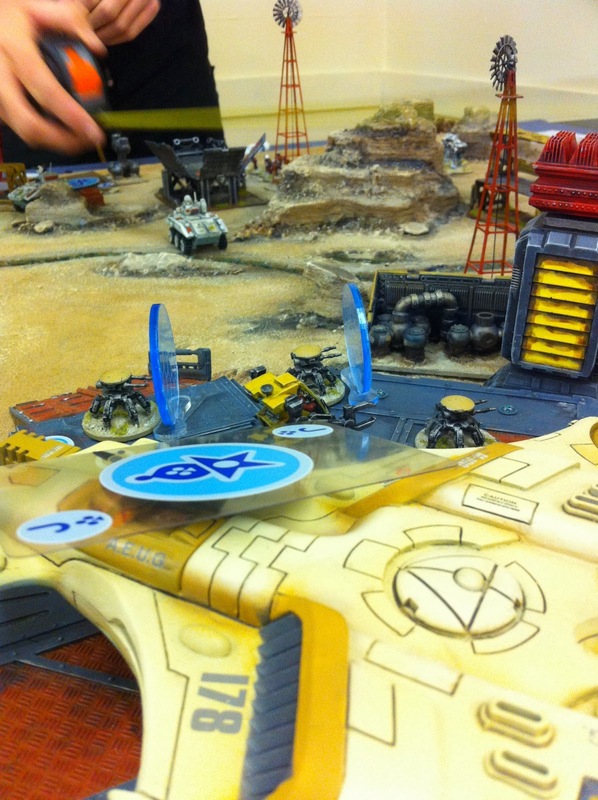 Drop Pod from Clear Horizon drops in a couple of Valkyrie walkers to harass the flank of the EHTC forces.